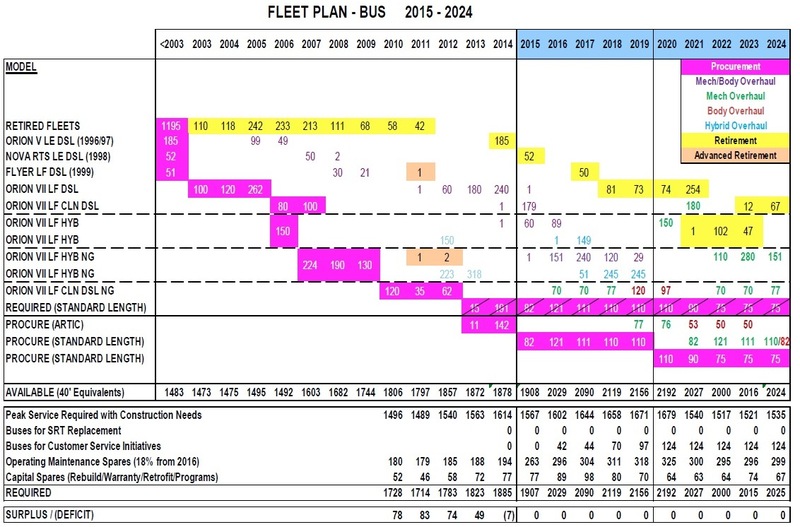 Updated June 27, 2015: The TTC’s 2016-2025 Bus Fleet Plan has been added to the end of this article. At its June 21, 2015, meeting, the TTC Board approved leasing the former York Region Transit Concord garage at 8301 Keele Street (between Highway 7 and Langstaff Road). With 50 new buses to be delivered at the end of 2015 and no place to put them, the TTC desperately needs more garage space. The planned McNicoll Garage will not come on stream until 2020 and this leaves Toronto with a shortfall to handle both ridership growth and restoration of better crowding standards for peak service just as political support for improved transit has returned to City Hall. The capacity of existing garages in May 2015 shows how close to the line the TTC already is. The numbers below are stated in 12m bus equivalents counting each artic as 1.5 vehicles. Maintenance spares are additional to the scheduled service, and this ratio is planned to rise from 16.8% to 18% in 2016. Capital spares are vehicles that are either in warranty/retrofit programs, or are going through mid-life cycle rebuilds. The capacity of the garages including room for maintenance is only 1,630 [per TTC Board report], but the rest of the fleet is not sitting at Hillcrest for overhaul. In fact, the garages are overcrowded because more space is needed for routine maintenance than is actually available. If the loading standards for peak service are improved by 10%, this will not affect every route in the system because some of the minor ones operate with elbow room to spare. This typically occrs on routes with few vehicles where adding or removing one bus has a very large effect on the average load and service cannot be scheduled exactly to the current standard. However, if more buses are needed on, say, routes using 2/3 of the fleet, this would represent an increase of about 100 buses for service plus at least 120 spares. Ridership growth at 3% per year over the next five years would add at least another 250 buses to fleet requirements absent any offsets for expansion of the rail network. The TTC’s 2015 Fleet Plan was based on a lower growth rate, and had no provision for improvement in the crowding standard. 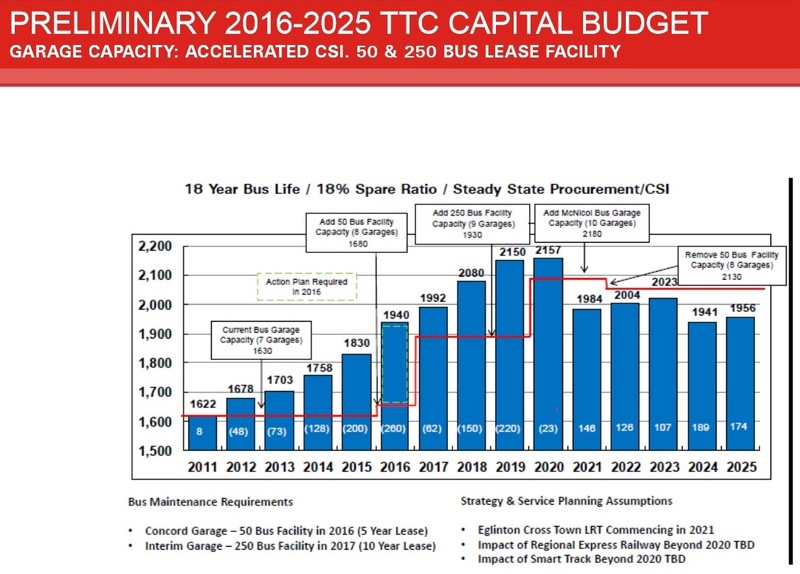 Some buses will be released by the opening of the TYSSE at the end of 2017, and there is another drop in 2021 after the Eglinton Crosstown line replaces busy routes in that corridor. Only at that point does the number of scheduled buses drop back to current levels, and so extra space is needed in the interim just to maintain loading standards, never mind to improve them. Concord Garage can handle up to 90 12m buses, but planned service improvements to 2020 will push the fleet to almost 500 buses beyond existing garage capacity. McNicoll Garage will be completely consumed the day it opens, and the TTC will still require another new garage subject to whatever savings new rail lines might bring. An updated fleet and garage plan will appear as part of the 2016 budget process. The challenge will then be for Council to continue its pro-transit stance with funding for better bus service, not just for construction projects. As part of the Preliminary 2016 Capital Budget background material, the updated fleet plan is now available. This shows the evolution of fleet requirements relative to garage capacity. The planned increase in the total fleet shows that the TTC is making provision for service increases in coming years, despite original indications that the 50 buses coming late in 2015 were a “one shot” improvement. What exactly will be proposed is not yet clear because the details of future operating budgets are not yet public. There is a drop in the rate of increase in 2017 likely due to the net effect of the TYSSE opening late that year, and future drops the correspond to the opening of the Eglinton Crosstown and the GO/RER/SmartTrack service and Scarborough Subway a few years later. This shows how an additional garage beyond even McNicoll is required well into the next decade. Indeed, even with some additional rapid transit capacity, the bus fleet is hardly going to vanish. A 2% annual fleet growth would be equivalent to about 40 buses, or a full garage worth in about 6 years. The intriguing part about this plan is that a new garage of the same size as McNicoll is needed by 2017. We could have McNicoll by then if the project had not been sidelined thanks to the service and funding cuts of the Ford/Stintz era. “Saving money” does not always save money. Also: if the TTC were to build another new garage after McNicoll, where would it go? Steve: They have been looking, but the problem is that many buildings are not suitable for a variety of reasons including structural (floor strength) and open space (room to manoeuvre vehicles). They are still searching for property for the next garage after McNicoll. One obvious question is whether at some point Queensway will be closed as it is the oldest and smallest garage. This would only add to the pressure for space. Steve: It is now a vacant lot. This would be a net new garage and it would have to go through the EA process. I don’t imagine that the neighbours would be too happy about dropping this into what is now an almost entirely residential (formerly partly industrial) neighbourhood. Since it makes sense to spread the garages out somewhat to provide shorter runs into service, is there an area of the city (other than the core, where land prices would be prohibitive) that would be preferred? Just eyeballing how the existing (and planned) garages are scattered around the city, there aren’t any big gaps – maybe near the airport? If the TTC were to seriously consider purchasing the Obico Yard lands, they could split the land between a train yard and a new, larger bus garage to replace Queensway. The oldest is Birchmount, but I guess it holds more buses, even though Queensway is newer. I thought TTC was going to use Danforth as a temp garage, I’m sure it can hold 50 or more buses, aren’t the hoist still there, plus its already owned and still in use by TTC. Even Mtd, there is land space behind the employee parking, more than enough room for more buses. I wonder If TTC will think of expanding an existing garage? I’m surprise TTC is looking at more garages after McNicoll. With the Finch West LRT, TYSSE, Eglinton Crosstown and potentially SSE they still need more bus storage. Steve: Ah yes, Birchmount is actually older, but it is larger. Queensway has a cramped feeling about it, but that may simply be its size. A lot of Danforth has been given over to other uses, and as with Lansdowne, reactivating a garage space in a residential area would be a challenge. As for the offsetting value of rapid transit routes, this will help, and I look forward to seeing an updated fleet plan including provision for growth, better service standards and those rapid transit offsets. All that said, the TTC has been burnt before with promises of new rail lines, and until we actually see them under construction, it’s hard to take them as a certainty and plan accordingly. For example, Queen’s Park includes Sheppard LRT in the future project list for the early 20s, but I won’t believe it until I see it. One obvious question is whether at some point Queensway will be closed as it is the oldest and smallest garage. Steve this is incorrect as Queensway was opened in 1966 and Birchmount was opened in 1956. You may have been thinking of Parkdale Garage which Queensway replaced. Steve: No, I was thinking explicitly of Queensway, but it always “felt” older for some reason to me. Realising that this is probably 2025 before this facility is up and around, but I vaguely recall some suggestion that the land west of Jane along Finch that is slated for the LRT carhouse for the Finch West LRT was being built to facilitate the Jane and Sheppard East LRT projects. As the Finch to Sheppard connection is unlikely and the Jane LRT dead, would there not be capacity on that site (obviously not now) for buses? Steve: Finch West carhouse was never going to serve Sheppard — that line was part of Conlins Road’s design. That Finch/Sheppard connection was a stupidity added to the Transit City map by Dalton McGuinty’s doodling, and was dead-on-arrival. Joint use for a bus garage is certainly a question worth raising to Metrolinx and TTC. “If the loading standards for peak service are improved by 10%”? 10%? Where have I heard that number before. Oh yes, Rob Ford wanted a 10% cut by everyone, including the TTC. Guess we now have the result of that directive. Now we have a new directive by John Tory for a 2% cut, including the TTC. I have to shake my head… again. Steve: David Miller added 10%, and to Rob Ford all works of Miller were anathema and had to be expunged, ergo a 10% cut. This also, by the way, allowed TTC to defer work on a new bus garage and is directly responsible for McNicoll being so late relative to need. As for Tory, I await a miraculous conversion. Has the TTC considered leasing the property currently storing PanAm vehicles, located at the Cherry & Commissioners S.E. corner (across from T&T supermarket)? Couldn’t a semi permanent structure be built quickly in lieu of what ever permanent garage gets finished? A wash rack could be adapted into a snow brusher if the TTC went with the outdoor track/parking option. Steve: This location is quite a distance from any “real” garage where vehicles could be fuelled and serviced. Also, the site is planned for construction of a school for the new eastern waterfront population. I hope that the conversion comes. Having said that Tory seems quite the pragmatist, ST was a required electoral gambit, and so forward it went – even while in my mind being fundamentally dishonest. I hope that he will govern in a manner that is more honest – but equally pragmatic – for the city’s best interest. This will require, that he listen to the experts and create policy, at least as carefully as he crafted a platform – and find a way of having the two be relatively unrelated. RER (call it ST) on Stouffville and Kitchener, on 10 minutes or better (make it fit as part of the network) at a TTC fare would be good for the city. Too many stations, will undermine the regional value of these lines, however, all trains at all current stops would be a huge value. The problem I have, is that I see this as requiring more – not fewer buses, at least until a supporting grid of LRT is in place. The idea of RER, (and ST) was to deal with congestion, and this means getting many more people out of their cars, and that means starting their transit journey much, much closer to the homes. To succeed it means people just presuming transit is the way to travel, creating a sense that transit goes there now… for most trips I might take. If this were to succeed of course it would mean that a couple of hundred extra buses would not even scratch the surface of demand – in a post RER, Vaughan subway, Crosstown and Finch LRT world. Toronto needs to plan to create the service that will attract a 40% transit share in Scarborough and Rexdale, and a sense that there is always a bus, streetcar, LRT or whatever either in or about to be in sight. Hey Steve, I’ve got a couple questions regarding Concord. Is there any indication as to how long the TTC will have the lease for? Until McNicoll, or further? Will this be a standalone garage, or a satellite Arrow/Wilson? The report says York Region would need to bring it in line with the TTC’s SoGR, would you happen to know what’s lacking? Steve: The lease is for five years plus an optional five more. It will operate as a satellite of Arrow road. The landlord is not York Region, but a numbered company, and, no, there was no discussion of the repairs needed. It is possible that this will be in the confidential section of the report to be released after the deal is signed. I wonder if it might just be easier to do what they are doing in California – a multi-level bus garage. Steve: That garage (Division 13 in Los Angeles) only has capacity for 200 45-foot buses, and so it is actually smaller than most TTC divisions. Operationally, the TTC prefers to stay at 250 buses as a target design size because this gives a fleet and body of staff who are manageable as a unit. One operational issue is that a substantial proportion of the fleet has to enter service within a short period, and there is a comparable crush when they come back at the end of peak periods. I thought my eyes misled me, but I just saw 8407 on 165 Weston Road North. Yep, the urgency is coming (even if it is slightly offset by Nova RTS retirements). When there’s no more space for new buses, some Orion VII NGs should be sold to York Region Transit because they have opened a new Transit Facility at Leslie and 16th. That way, it can replace all TTC routes in York Region with YRT operated routes. Steve: It’s not a question of having buses. YRT contracts some routes to TTC because of the through riding. Just more convenient for them. Why not? Give some TTC buses to YRT when there are no more space for new buses!! YRT probably wants them! Steve: TTC needs every bus it can get. They are leasing the old YRT garage space as overflow from their own system, and are still looking for more room. I was missing something else about this thing Steve. Left out is the former Davenport Garage which was closed in 1993. That would have been used as a satellite yard for Wilson since they operate some of their routes just south of Eglinton. Danforth would have been feasible enough for reactivation as an operating division or a Birchmount satellite.